Do Workout Supplements Benefit You? Diet and exercise is the best combination to get fit. For some people, workout supplements may help with faster recovery and overall health benefit. Many supplements claim several different things. Not all supplements are legit and since the supplement industry is not regulated, you have to be careful which brands and products you use. It’s best to get advice on supplements either from someone who has extensive knowledge such as your trainer or someone honest in the supplement industry. Your trainer can tell you about supplement side effects, benefits, dosages etc. What Kind Of Supplements Are Out There? Well there is a supplement for just about anything and everything. Determining what supplements will achieve what you’re looking for can be difficult due to the hundreds of options. So first of all, you need to know what you wish to achieve. Different supplements can benefit you in different ways. One supplement may give you more energy or help your body efficiently use its fuel. Another supplement will help build up muscle and then another supplement will help your muscles repair after exercising. Be really careful. Some supplement combinations are safe but other combinations can be quite dangerous. So determine what you wish to achieve, research, and speak with your trainer first. Do All Supplements Benefit You? Every supplement claims they can be beneficial to some folks but they won’t do the same thing for everyone. A lot of supplements are natural or may be herbal, which means that positive or negative reactions differ greatly from person to person. Those who workout are primarily looking to either build muscle mass or lose body fat. The best supplements for building and repairing muscles may be protein supplements. Adding carbohydrate supplements may further assist you in your pre- and post-workout phases. Carbs maximize your energy efficiency while spiking your insulin, used for repairing muscle. Some energy supplements will help improve your workout abilities and may also assist muscle recovery afterwards. Because no effects are the same for everyone, keeping good nutrition as well as a routine workout is the best thing for you. Supplements may be beneficial, but they can also present a danger. How Supplements Can Be Dangerous? Similar to prescription pills, workout supplements can include negative side effects. It doesn’t matter if you’re on medication, have any medical conditions, or if you have allergic reactions to supplements or not. They can still be dangerous. Eating meals that are well balanced gives you all the nutrition that any supplements would give you. Adding workout supplements to your healthy diet might add more of something which your body cannot compensate for. Also make sure to ask your trainer about cycling supplements. Not all supplements are meant to be used all the time. 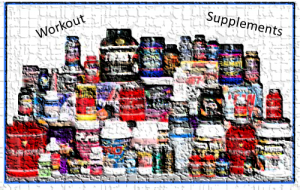 Some supplements should only be used for short periods of time. You don’t want your body to become dependent on the supplements nor do you want any long term side effects from using strong supplements. Ask your trainer which ones are safest for long term use and which ones are not. We can’t stress it enough: Speak with your trainer first about what supplements can benefit you on your road to a healthy fit body.